This "Cinderella" of butterflies is unlikely to raise the heart rate of butterfly photographers or create any sort of excitement when spotted. It is a relatively common and unremarkable species that is encountered at the fringes of the nature reserves amongst grassy patches. It flutters weakly at low levels and stops to perch, either with its wings folded upright as is shown here, or opened when sunbathing at certain hours of the day. However, it is alert and somewhat skittish and it would take a bit of persistence on the part of the photographer to get a shot of this butterfly on an ideal perch. The Common Three Ring is the largest member of the genus Ypthima in Singapore. 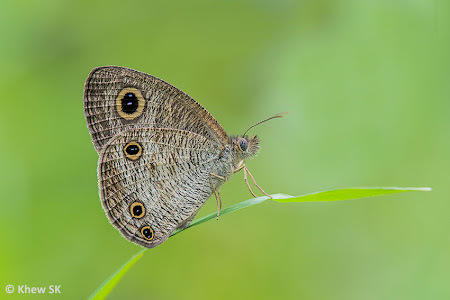 It is greyish brown above, with a large subapical black yellow-ringed ocellus on the forewing. There are two silvery spots in the black ocellus. 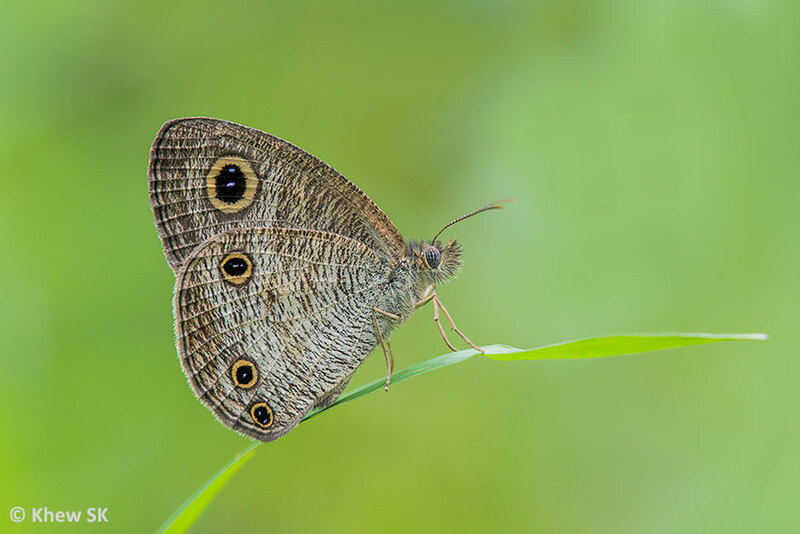 On the hindwing, there is a similar but smaller subtornal ocellus, and another pair at the tornal area. The underside is greyish to pale buff brown, with the wings traversed by innumerable fine dark brown striations where the hindwing has three yellow-ringed black submarginal ocelli.